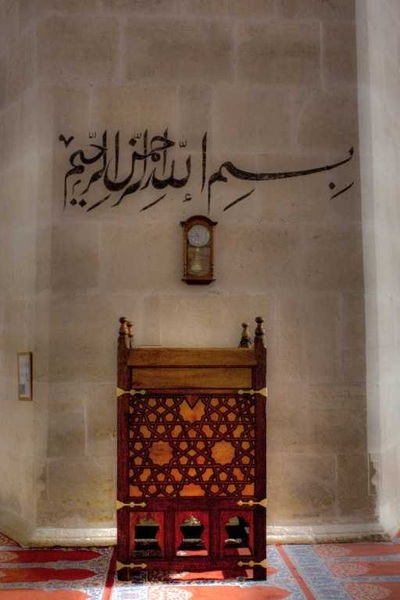 Uc Serefeli mosque was built by famous architects Muslihiddin and his assistant Sahabettin Usta at the request of scholar and poet Sultan Murat II, who is the father of Sultan Fatih Mehmet, the conqueror of Istanbul in 1453, between 1437 and 1447. 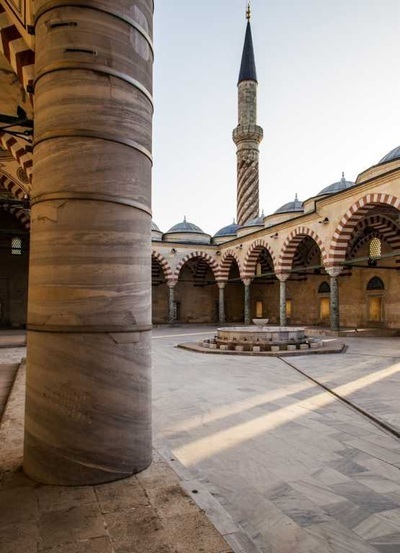 It is very important structure in Edirne that period because it reflects a passage from Early Period Architecture to Classic Era Style or from Seljuk architectural type to Ottoman style. 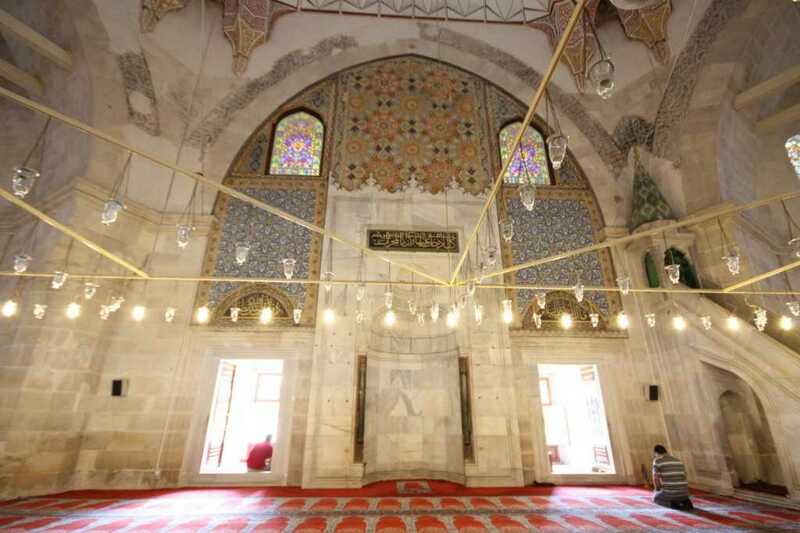 Being the source of inspiration many architects and artists like especially Great Architect Sinan, the building has been pioneer for the field of art and literature which creates various innovations today from past. 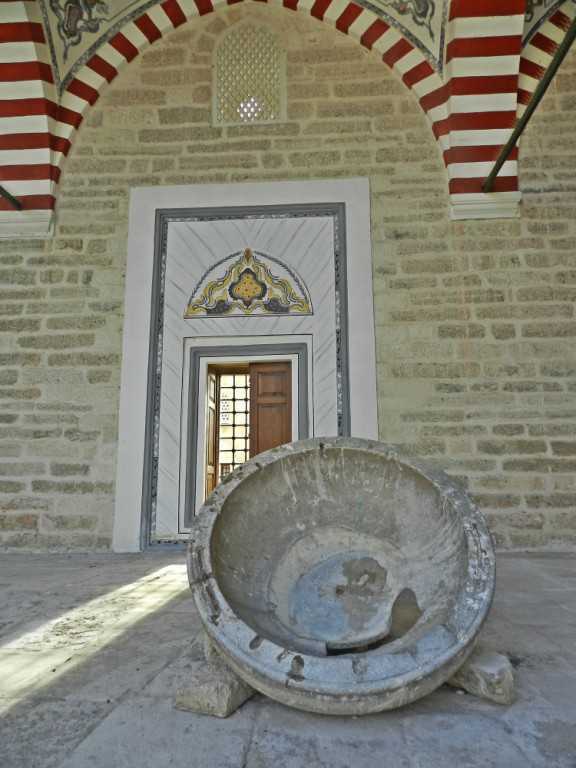 Classical centre planned mosque was surrogated by Saatli Madrasah, Education Intuition (Mektep) , Tashan and Sokullu Turkish bath, Peykler Madrasah in the south part. Three minaret balconied mosque is one of the first Ottoman model samples. It is firstly seen in Islam history that there is located charming rectangle sadirvan (water-tank with a fountain) in the middle of mosque’s courtyard. Surrogated by 22 fascinating porches, courtyard has three doors; every doors look different way. The door in the west is more ostentatious than the others because it is directly connected with the city. Additionally the first minarets with different seizes were seen here: that structure has four various minarets which covers 66.50 m x64.50 m field. 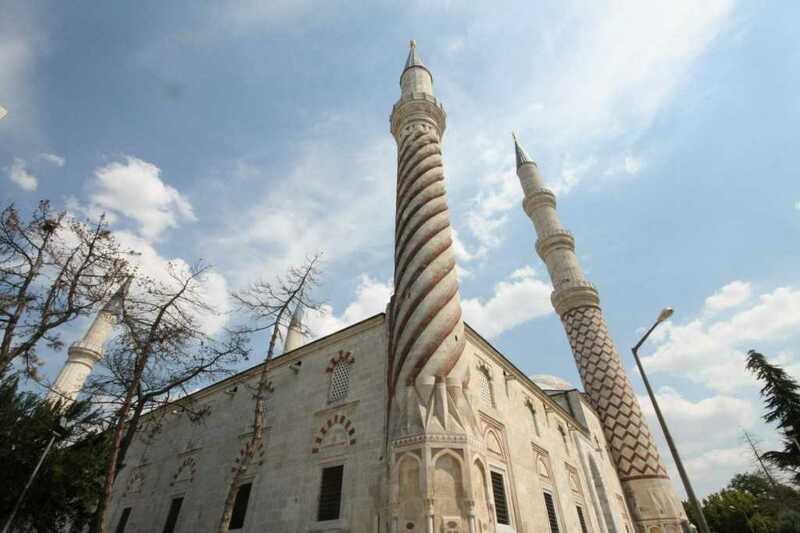 The main minaret contains three minaret balconies arrived by using three separate ways. It is 81 m in high. The second minaret with two roads has lozenge shaped and two minaret balconies. The other minaret located at the back of the yard includes one minaret balcony. Due to its grooved and wreathed shaped, that magnificent mosque is also called as Burmane (burmalı in Turkish) Mosque. After the building of that mosque, it was applied to single and centre dome style from the construction with multiple dome. Situated at the centre of the mosque, the big dome which has 24 m in diameter was placed on the six dreamy pillars decorated with the Islamic calligraphy and porches. The special construction contains totally 9 domes. 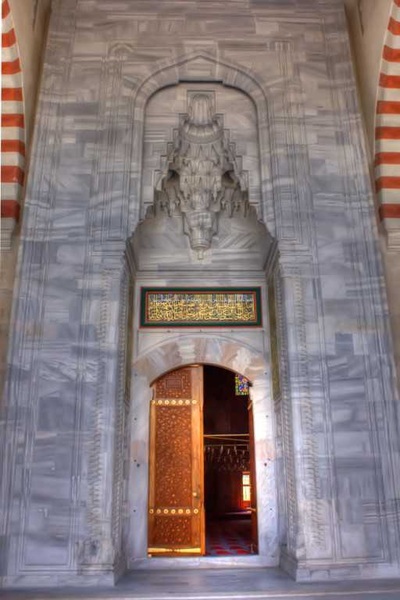 Except for those features, there are also found a middle door, Cümle Door; when the visitors step into the sadırvan location, they use that door in order to entry the inside of mosque. Crown gate looking the yard covered with the porches was furnished with the marble decorations such as muqarnas (stalactite), convoluted branch motives and Rumi figures which are kind of relieve. That splendid building has four incredible doors which every doors open different mystic world. In the next to the mosque, there is found a graveyard which includes approximately 195 tombs belonging to the period of governor, pasha, professor, mufti, officer, kadı and merchant. 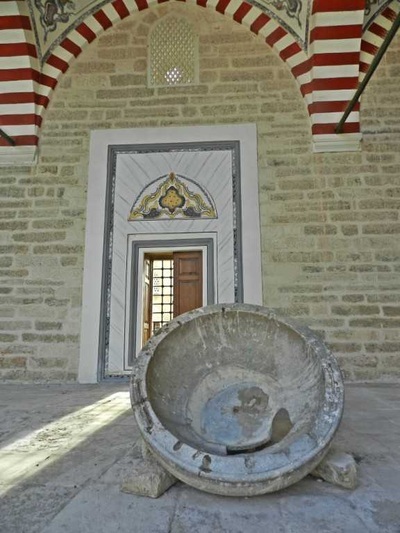 In 1752, that building was damaged in a big earthquake but it was rebuilt by architect Hacı Ahmet with the order of Ottoman Sultan Mustafa III in 1764. According to a historian Evliya Çelebi, being absolutely a paradise of flower, the fountain of that mosque flow hot water in the winter. Today it also fascinates the people with its multi-coloured tulip figured lamb. There are established two columns made of porphyry in the entry of mosque. There is a story about those columns: According to a rumour, once upon a time the two architects of the building saw the same dream in a one night. And after day, they told their dreams each other. They said the same image; it was about an angel visiting the mosque and standing today’s columns’ location. Therefore they decided to build those structures here.